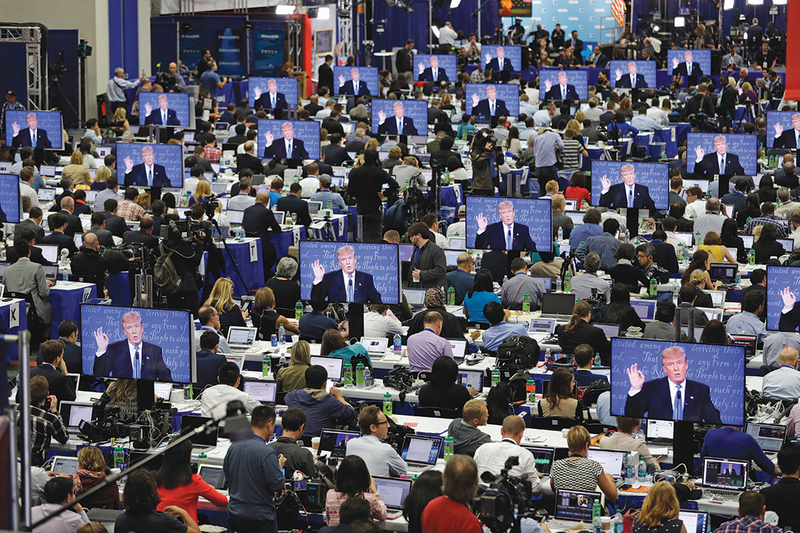 View of on-site media center at the presidential debate between Donald Trump and Hillary Clinton, Hofstra University, Hempstead, New York, September 26, 2016. Photo: John Locher/AP. THIS MONTH, the forty-fifth president of the United States will be sworn into officebut not on the Bible. Indeed, no sacred text or tome is required to administer the oath of the presidency, and this time, for this man, the only playbook is that of spectacle. People who study politics have long used two basic models of explaining how the world works. The first is realpolitik, whereby a group or state acts in its own interest, that is, in the interest of amassing power. The second is ideology, according to which a group or state acts based on a belief or cultural more, whether a religion or an ethics or mere zeal. The difference with Donald J. Trump is that he seems motivated by neither model. He has no consistent ideology; he appears to contradict his every word almost immediately after uttering it. He does not evince any rational decision-making based on strategic goals. He is instead motivated by one thing: media. The West’s incoming leader is driven, in other words, by the image. His regime is built on visual and perceptual culture (complete with an old-school minister of propaganda, Stephen Bannon). This is by no means new, of course, on the stage of world politics. Since time immemorial, real conflict has arisen because of perception and the escalation of perceptionone example is what political scientist Graham Allison has called “the Thucydides Trap”: when an ascending power is seen as a threat to the dominant power, and that spiraling fear leads to war. (Thucydides wrote, “What made war inevitable was the growth of Athenian power and the fear which this caused in Sparta.”) One watches this dynamic at work in Trump’s cultivation of fear and trigger-happyor Twitter-happyresponses, just as one saw it in the Iraq war itself, a fraudulent response to a perceived threat. The power of the visual has ascended to ever-greater heights, even in a world of invisible networks of control, of flexible and tentacular streams of surveillance, biopower, and microregulation. But at the same time, the top-down dissemination of information via mass culture in the twentieth century has been hyperdiversified, splintered. Today, we confront the spectral atomization of disinformation throughout the dark reaches of the internet, the most esoteric voices flowing like microscopic particles into the lifeblood of the media apparatus. Technological networks can amplify these bits and flowsexponentially, monstrously, radically. And the most effective vehicle for these streams is the image: the appearance of truth, or of might. Trump seems to believe that he projects an image of white male strength, but his visage is far stranger than that: No matter what words emanate from that mouth, the orange scowl is such an affront to the placid miens of the Romneys and Clintons of the world that it cannot but upset the order of things. This is no telegenic Reagan smile but the rictus grin of an anarchic troll. Trump’s image produces a reality effect like no other before it. The unprecedented proliferation of such images, and the rise of fundamentalisms and populisms over the past several years, has demonstrated that the unthinkable can happen: that the most extreme viewsthe fringe, the altcan suddenly assume the seat of world power. That statistics and polls can be extravagantly wrong. In previous essays in these pages, I have written about systems of global control that are often construed as “seamless and totalizing,” yet which are increasingly overwhelmed, thwarted. But at the time, I had no idea just how contingent the world would become. What we are experiencing is what sociologist Ulrich Beck called the “risk society,” wherein scenarios we cannot predict are constantly escalating. Unintended and unforeseeable side effects have everywhere become the main event: black swans, market crashes, floods and storms. Modern, rational institutions of regulation and control are continually upended by outcomes for which we have no model, no data, no rule. Indeed, to believe that such institutions won’t failthat they are infinitely powerful, adaptable, flexibleis to retain a humanistic faith in man-made systems of control. It is to presume yet another kind of determinismone that fails to understand the unexpected risks and ruptures, the accidents, that may render received wisdom about power and agency and causality obsolete. We should by no means underestimate the consolidation of sovereign authority or the spread of surveillance today (Putin-Comey-Google, are you listening? ), but we should question any simplistic assumption of an all-seeing, totalizing, monolithic governmental or financial power. That’s the kind of conspiracy theory that the alt-right embraces, and it is too easy, even comforting; it makes for simplistic critical binaries, too. So what does this upending, the unthinkable become reality, mean for other movements and activisms, other visions of the world? Clearly, within the context of liberal democratic politics, there is practical work to be done on the ground, changing redistricting laws and fighting to restore voting rights; attempting to further the causes of social and economic justice and civil liberties, both systematically and through small acts of volunteering and organizing in local communities. Yet apart from such work, it is crucial that extreme and unprecedented thinking be realized in the name of other worldviewswhether within unraveling states or within the most autocratic governments, as have unfolded outside the West over the past decade. Just as other disciplines have, art must think the unthinkable. Art must counter image with imageconstructing pictures but also precipitating their undoing, their disruption, their unmooring. 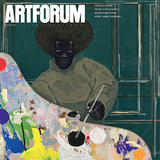 Just as Trump’s image seems to usher forth a world of risk, a state of chaotic volatility, art has long fomented the contingent, the unprecedented. Like spectacle, art seduces, frightens, incites, deranges; it glows. In another delirious moment, facing another rise of nationalism, autocracy, and a new world order, Siegfried Kracauer wrote that the artist’s “tasks multiply in proportion to the world’s loss of reality.” The artist must ultimately take on the role of “the observer who not only sees but also prophetically foresees.” Art can and must foresee other pictures, other worldsto which we can look, and for which we must fight.